George IV , the king of Great Britain and Ireland from 1820 to 1830, was one of the most detested British monarchs. He was also a man of exquisite taste who profoundly influenced the culture of his age. Regency England, roughly the first 3 decades of the 19th century, takes its name from George's title of prince regent, which he held from 1811 to 1820. It was a period of great elegance in art, architecture, and the style of aristocratic life, and also one of unrestrained indulgence and moral laxity. The prince regent set the example in both respects. The future George IV was born on Aug. 12, 1762. His father, George III, an extremely moral and pious man, loved his eldest child as a son, but hated him as his heir. For both reasons the young prince was kept under a very tight rein and carefully insulated from the outside world. In 1783, when the prince came of age, he violently reacted against these restraints and entered society with a great splash. George was tall and handsome, with a tendency toward portliness, which in maturity was to become gross obesity. He entered into the pleasures of life with gusto, and Mrs. Fitzherbert soon emerged as the first of a succession of mistresses. He began to indulge his passion for building, and the Royal Pavilion at Brighton was begun in 1784. By 1787 the prince was already hundreds of thousands of pounds in debt and had to be bailed out by Parliament, the first of many such occasions. The prince's escapades strained relations with his father, and political differences increased the tension between them. The prince became the intimate friend of George III's bitterest political enemies, the Whigs, led by Charles James Fox. Fox was a man of immense personal charm, and Whig society was the most glittering group of the day. The Whigs fought the prince's battles for money in Parliament; he entered fully into their political schemes. Together they waited in 1788 in ill-disguised anticipation that the King's insanity would prove permanent and that the prince would become regent. George III, however, recovered. The prince had not been able to grasp power, and his reputation had suffered. It suffered still further from a secret, and illegal, marriage to the Catholic Mrs. Fitzherbert, which soon became common knowledge. In 1795, at his father's urging, the prince decided to regularize his position and increase his income by making a legitimate marriage. The choice of Princess Caroline of Brunswick could not have been more unfortunate; she was coarse, vulgar, and wildly eccentric. It was an arranged marriage, and the prince detested her from first sight. The marriage was barely consummated when the couple separated. Princess Charlotte, their only child, died in 1817. Caroline's notorious affairs in England and abroad only served to underline George's own sexual irregularities, and their interminable bickering until her death in 1821 surrounded the monarchy with scandal. Without Caroline, George's reputation might well have been higher. He was warm-hearted and generous, and devoted to his often motherly mistresses. He was also a man of superb taste. England is in his debt for some of its most famous and beautiful architectural treasures. Regent Street and Regent's Park owe their beauty to him, and he rebuilt Buckingham Palace and Windsor Castle. The beautiful classical portico of the National Gallery came from Carlton House, his residence as heir to the throne. George made a magnificent collection of 17th-century Dutch paintings, and, as king, he persuaded his government to spend a fortune for a collection that formed the nucleus of the National Gallery. He filled his palaces with the finest examples of 18th-century French and contemporary English furniture. No British monarch, except possibly Charles I, ever added so much to the nation's cultural heritage. But George's tastes were expensive, and at a time when most of his subjects were experiencing extreme privation during the wars with France and their aftermath, his extravagance caused bitter resentment. In 1811 his father became permanently insane, and George was declared prince regent. The Whigs, however, did not come to power with him, for the prince's relations with the Whigs had become increasingly strained since Fox's death in 1806. In 1812 George did make an attempt to bring some of the Whigs into a coalition ministry, but they would not accept a compromise. George had never been a Whig by conviction, and thereafter he settled comfortably with his father's Tory ministers and advisers. He, however, was never the strong political influence George III had been in his prime. The blunt Duke of Wellington, his last prime minister, called George and his brothers "the damnedest millstones about the neck of any Government that can be imagined." In 1820, when he came to the throne on his father's death, George IV persuaded a reluctant government to undertake a divorce from his detested queen. This caused a national outcry, less because the Queen was loved than because George was hated, and the action had to be dropped. On occasion the King exerted his prerogatives, as when he chose George Canning over Wellington for prime minister in 1827, but in general George followed the advice of his ministers. He enjoyed his public role, and though old, overweight, and corseted, he played it with great dignity and a real sense of drama until he died, unlamented, on June 26, 1830. 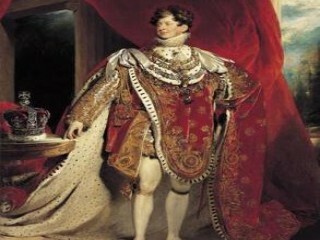 View the full website biography of George IV Of United Kingdom.